Please register (email is best, shodo.spring@gmail.com) to get details and arrange carpooling. Wear outdoor clothes suitable for weather. otherwise we’ll start Saturday morning 9 am, optional overnight, and continue Sunday to 5 or dark. We can work around local church commitments. Optional zazen Sunday 6 am. Saturday, March 14: Some of us will carpool to a workshop in Amery, WI: Building a Regenerative Farm. It’s a perfect way to start off a season of learning. April 25-26: Site preparation for planting the orchard in the field by the road. We’ll work together with the professionals to strip till, create micro berms and swales, and bring in materials. May 9-10: planting trees, follow-up, and berries. We’ll follow the plan laid out to complete the orchard. Depending on time, there’s also a buffer strip to plant, and the whole berry section (with flowers for pollination). The berry section will be fenced. Mountains and Waters Zen group in Northfield, 1st and 3rd Wednesday evenings 6:30-8:30 at NBMC: Feb 18, March 4 & 18, April 1 & 15, May 6 & 20, etc. Come 15 minutes early for instruction; 313 1/2 Division St, easiest to enter from Washington Street. I am speaking on April 12 at Northfield Unitarian Universalists. 10 am, 113 Linden St S. (Call me if you need accessibility information.) It’s possible to sit at NBMC and slip in a few minutes late to the service. I hope to see you, here or somewhere. I’m putting this information here so it’s all in one place. If you are interested in any of these, please contact me at shodo.spring@gmail.com or 507-384-8541. Spend one weekend per month working and learning. Projects may include planting an orchard, land conservation, maple sugaring, water management, and other tasks involved in establishing a diverse woody polyculture farm (aka permaculture or regenerative agriculture). A year’s commitment is requested; the program will continue for multiple years. Overnight stays are optional. Carpooling will be supported. Expect a combination of exciting learning and plain old work. This is a no-money project. The ideal candidate has these skills. 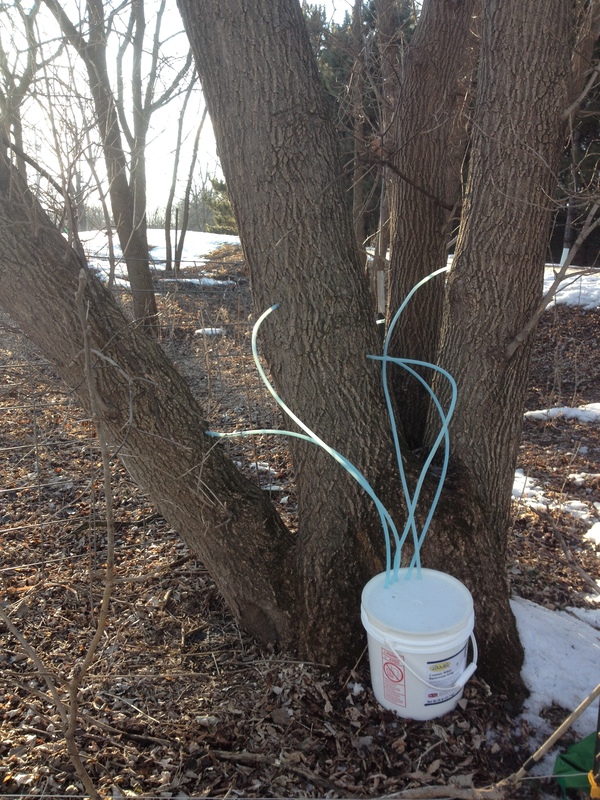 plus grafting, maple sugaring, bees, animals, forest products, putting up food, and marketing. Please call or send resume and your requirements. Compensation could include opportunity to start your own small farm businesses on our 17 acres. South of Northfield, one hour from Minneapolis. Two chicken houses for humane organic chicken raising. Rent could include cash, eggs, and/or fix-up help. We could help with chicken care but not do it all. Here is a summary of the farm this year, and a request for money to help us continue manifesting the dream. Found and bought the land, moved in, met neighbors. Planted a garden, foraged, planted a few trees and shrubs, explored the woods and fields, learned local plants and animals. Pickled, froze, and otherwise put up a lot of food. Collected rain water from roof for drinking – excellent results. Experimented with goats and fences. Hired an experienced permaculture designer who designed a perennial woody polyculture farm. Consulted with other specialists about water management, ponds, erosion, and outdoor space. Hired an architect specializing in passive house and alternative energy design. Figured out how to change the existing house (former barn) to hold 6 people and function off-grid. Chose a provider for photovoltaic panels. Hosted volunteers and guests, plus some paid workers, and two longer visitors, one of whom will move here in 2015. Did a lot of erosion prevention. Bought two chain saws and cut a lot of firewood. Bought a wood cook stove. Had a masonry heater built. Super-insulated one level of the house. Went to farm trainings, conferences, field days, and such for a very intense learning curve. Talked with lots of government people and farming organizations. Started relationships in farming community. 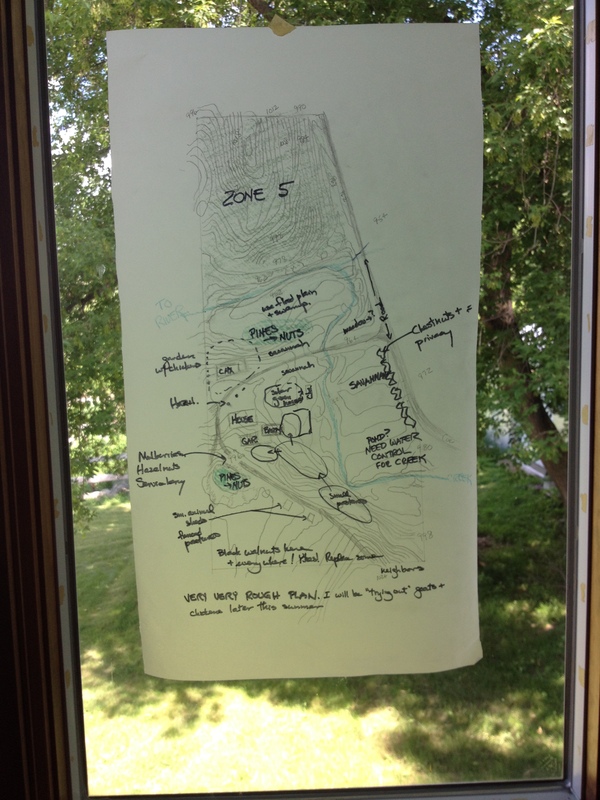 Had a retreat every month since July; created a zendo in former bedroom; identified future zendo location; identified outdoor spaces for future ceremony and retreat. Started Mountains and Waters Zen Community. Set up council of advisers, represented the farm to others, created brochure and blog, got a nonprofit fiscal agent, kept track of spending. Find farm manager, more residents, apprentices. Start tracking all that volunteer time. Convert the house to a passive solar home for six people (some spaces are open). Start serious farming, and teaching others. Install orchard, berries, and other plantings. Harvest maple syrup, nettles, mushrooms, and begin marketing. Conservation and land care as able. Offer spiritual practice opportunities, and communicate them effectively. Work with local Zen groups. Finish organizational structure and set up Board. Apply for our own nonprofit status. Raise money for these projects. Clarify future projects such as greenhouse building, food storage, water collection. If we were only committed to sustainable living, that would be nice but maybe just personal. If we were only about practicing Zen, maybe that would be of interest to people who want to join us or visit us. If we were just farming, there are sources of help for new farmers. But it’s more. Our whole existence – including farming and sustainable living, getting off fossil fuels, spiritual practice – is about the spiritual and cultural change needed by this society. We all are in need of reconnection with each other and with the other beings on the planet – evidence is in climate change, pollution, and the increasing violence everywhere. The business of Vairochana Farm is to foster that reconnection, including within ourselves and far beyond. Up until now, I’ve personally funded the farm from my retirement savings, because this matters deeply to me. Now those funds are low. More importantly, the mission of the farm is all about community and cannot succeed without commitment from that community. If you are serious about driving spiritual and cultural change, I need you now. There are several easy options. Tax-deductible: Vairochana Farm is now a project of Minnesota Alliance for Sustainability, a wonderful umbrella group that sponsors all kinds of sustainable activities. You can make a tax-deductible contribution here. Old fashioned check: You can still mail a check to Vairochana Farm, 16922 Cabot Ave, Faribault MN 55021, as some people have done. Mailing a check will not get you a tax deduction, but 100% of the money will go straight into our checking account. We also have a Paypal account (VairochanaFarm@riseup.net). If we raise $20,000 by the end of January 11 (that’s $1000/day), our architect/builder can proceed with renovations, lifting part of the roof for additional bedrooms and solar gain. This allows reasonable space for longer-term visitors and/or two more residents, which helps with living expenses, work, and creative energy. After that, donations go to starting the farm, plus the renovations that give us full living space, plus getting off fossil fuels, and eventually reaching out to sponsor others. Thank you to the people who have already given, especially without being asked! 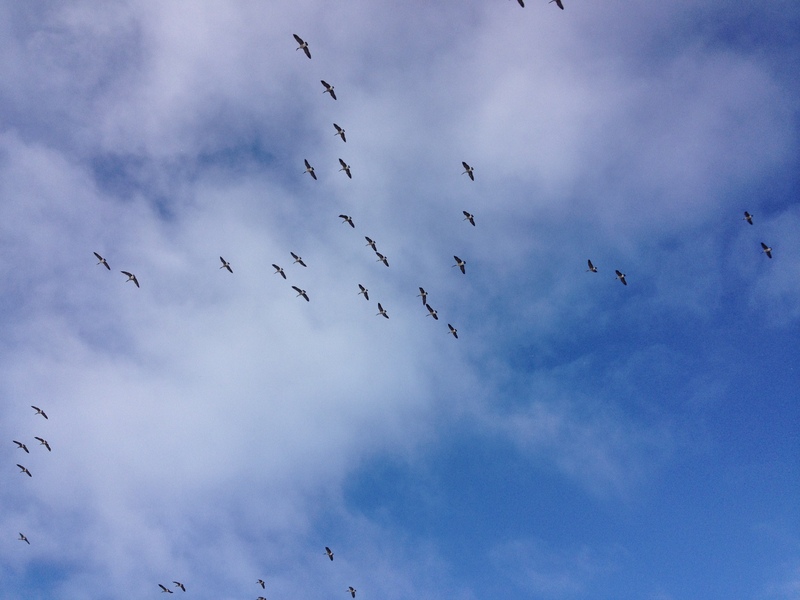 Since my last writing, the birds have flocked. Now it’s all about cold and snow. We can see through the woods, see the shape of the land that had been hidden under the green. Farming is done for the year, except perhaps I’ll be able to dig up the last carrots (under an inadequate cover, not a real cold frame). I’m eating from the plants in pots by the windows – onion, celery, and a few herbs – brought in before the freeze. I was given lots of apples and have mostly been making applesauce. There’s a mouse – four about two weeks I’ve taken out one or two mice every day, in a catch-and-release trap, but the current mouse seems to be able to get the cheese without triggering the trap. There’s more I could do but there are other things to do as well. Tuesday morning zazen is now open for guests to come and sit – which so far means often there are two of us on Tuesdays. I sit every day, but to be open requires snow removal, outside lights, and not scheduling early meetings – so it’s one day a week. Two people have visited to consider living here; both have been wonderful. Roy is here now, outside happily cutting firewood while I get caught up on paperwork. He’s an Advaita teacher, and we’re having very interesting conversations. Soon I’ll go out and split wood, giving my body a break from sitting still. The small Zen group in Northfield has a name now: Mountains and Waters Zen Community (Sansuiji in Japanese). This is a big step. Some people from the group have come out to the farm, once for our regular Wednesday evening gathering, twice for retreats. Every month there is a one day silent retreat at the farm. In December it will be seven days, the traditional Rohatsu sesshin honoring Buddha’s enlightenment. I think I will have some company but not full time. It’s difficult to sit so long, but it also nourishes me and I’m looking forward to it. 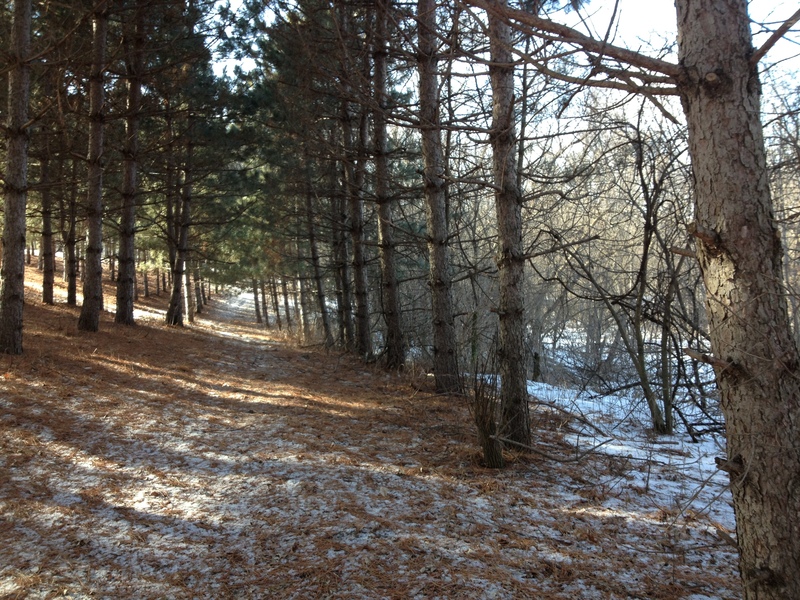 Last week at the November retreat I allowed one hour for silent walking outdoors, and I think I’ll do that again. A 1-5 day retreat on the second weekend of every month, beginning February. Some of these will involve guest teachers, some will be community-oriented with work projects, some will be just sitting, and at least one will simply be introduction to Zen. Three-month practice periods, less formal than at a monastery, but times for guests to come for focused practice in the context of living with the land. Long-term residence: what that means is still being developed. The plans to get off fossil fuels and have space for six residents are moving slowly. December 1 (yes, during Rohatsu) the mason will start building the masonry heater. Before and after, some carpenters will put in the stovepipe and set up the wood cook stove. Meanwhile I’m keeping the house at 50-60F, wearing sweaters and snow pants, sometimes running a space heater in one room. How much wood do we need? Maybe 4 cords – but less because the heater is efficient. There is a farm plan, small enough to do successfully next spring, involving lots of fruit trees, berry bushes, and hazelnuts plus pollinator plants and anti-GMO screen plants. Plans to fully insulate the house and get passive solar working are taking shape but require fundraising. My farm manager has become a full time architect (and my architect), so I’m looking for a manager. Or two people: one to run the farm and another to get grants and do administrative things. Of course, to pay them – see fundraising above. From anywhere: Share the link to the page; offer long-distance skills; help network, help me find money. Somewhere may be a philanthropist for whom this is their dream project – do you know them? Invite me to speak – I’ll be traveling this winter and might be in your town. I talk about Zen, Zen activism, or can share the farm vision. Plan a visit or come for a retreat, workshop, practice period. If you’re local: Come by, volunteer a few hours, come for a sitting. Bring food, especially during a retreat. Let me know if you have tools to lend or share. I’ll be writing more often. The same things go on the wordpress blog and on the Wheedu page. Write on the Wheedu page – make it interactive! It’s fall here; the colors are in full swing and you can see through the trees – all the way to the river. Time to gather firewood, install wood stoves (got a cook stove), and finish processing the food brought in due to frost. Collecting black walnuts with no idea when I will finish them. Get the mower running for one last mow. In spring we plant trees, and remove about half the lawn. It’s a busy time; this will be brief. I’ll start with farm and practical notes, then move on to Zen and spiritual and community things. I’ve started a personal blog at www.CompassionateEarth.wordpress.com, which had been about the Walk. I’ll write there occasionally. 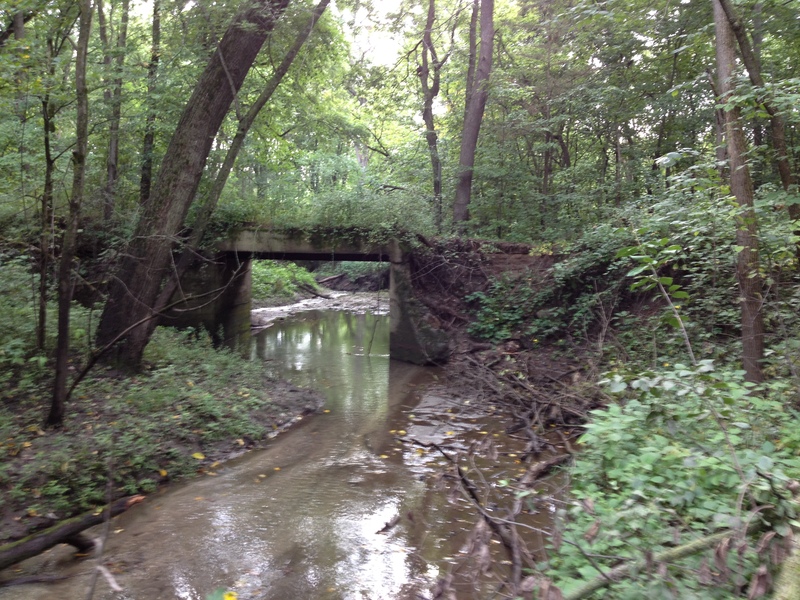 Land: there were two places with major erosion problems – the culvert under the driveway, and the “land bridge” that was pictured here before. 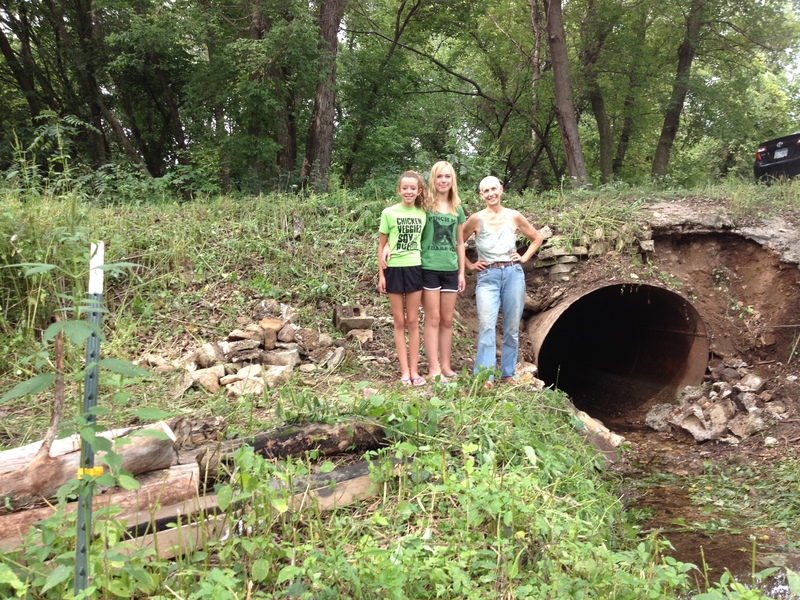 This Sunday the neighbors who share the driveway will be getting together to do culvert maintenance with rock and landscaping fabric. I can stop worrying, and I hope it will be a time of building friendships. On the land bridge, there’s been some work using fallen trees and dirt-filled burlap bags, while we waited for a bid from a contractor who is also a permaculturist. He put in a bid, we talked, and it seems like we can get the work done for maybe $5000 if we also get a lot of volunteer labor. More on money later. I’m working with the most experienced local permaculture designer, Paula Westmoreland, to design a practical woody polyculture farm. While she observes thousands of things to do – for example improving the health of the woods – she is helping me to take reasonable steps that I can actually complete. So we’ll plant some trees next spring (chestnut, mulberry, apple, pear, Korean nut pine) and some berry bushes, all with proper preparation and enough time to make sure they succeed. The following year will include hazelnuts, more pines, and I forget. Buildings: Last week it was so cold I had to turn on the propane. And this is early fall. I bought a wood cookstove that was not all rust, and Joe is coming today to start prep for installing it. I’m actively talking with the masonry stove builder, who thinks that might be November or December. I paid the propane company to fill the tank, and am still concerned about running out while I’m away in January. The architect (Joe) may do some interior work while I’m away, which could give a few more bedrooms and other practical things. The vision for six bedrooms plus a zendo and plenty of other space is pretty clear though not in drawings yet. But we don’t have a plan for storing summer heat for winter, and I’m restless about that. I imagine myself cutting wood with axes and saws at age 100, and I’d rather not. Meanwhile there’s a very small pile of firewood ready, but two good chain saws, and dry wood scattered around the property waiting to be picked up. The dream of a separate greenhouse/farm work building is still a dream. In the long run, it’s essential. It waits for people and money, both. Community: There have been several visitors. There have been volunteers, but not a lot. One friend and one lovely new woman came to the sheet mulch workshop; we got in two keyhole beds but I consider the relationships worth the advertising. I am trying to start a Faribault area permaculture guild or work league or whatever – so we can help each other at our farms. I’ve been too busy and distracted to send out a note about that, but there are 6-8 local groups I know about who seem like candidates. Last week Ben came for five days. We sat zazen morning and evening every day; I set the alarm and got out of bed on a schedule; it was lovely and I promised myself to continue. We worked morning and a couple hours in afternoon, took turns cooking, and got a lot done. We varnished the deck, cleaned a lot of things, moved furniture, did farm and yard work – all the unglamorous things that I avoid asking of volunteers. And we took a day off, as one needs to do. So “community” sounds like “getting work done.” That’s not what it is, but the work situation is pretty serious, as everyone on a farm knows at this time of year. I made brochures and took them to a Zen priests’ conference, where I also spoke on environmental activism and told the story of the Compassionate Earth Walk. A month before I’d taken brochures to the North American Permaculture Convergence. I’m trying not to hurry in recruiting residents, because the people I want are the people who want to sit zazen and work cooperatively and all that. Conversations are happening, one at a time, and I’m expecting that all will work out in its own time. Turning the house over to the carpenters while I’m away is totally appropriate; there will be space for more people at the time when people may be ready to come. The broad concept was that farming would support us, once the construction and plantings are done. It will take at least a few years because we’re investing in trees, but there is income here that I’m not making because I don’t have enough time or knowledge. (That would be more foraging, harvesting all the black walnuts, tapping walnut trees now for sap and syrup, selling timber, and going through all the antique tools left here, for sale or use.) In spring I hope to be ready for sap, mushrooms, and much more. All this is being funded for the moment by money inherited from my parents – which would normally become my children’s inheritance – and I’m doing my best to go forward prudently, spending what needs to be spent and not wasting. I have a little envelope with cash donations received for the farm; it’s always possible to mail a check; and after setting up temporary tax status I will do a major fundraising campaign this winter. Zen: The small group meeting in Northfield is becoming a real group, and will soon have a name. The sesshin one day a month becomes 7 days in December and then 5 until the spring work period starts up again. Though I’ll be traveling – in December to work with my teacher on finishing the book editing, in January to visit my Atlanta family. Time and money have gone into training and travels, and will continue to do so; it will probably be quite some time before the dana received balances the expenses, but there is dana and it encourages me immensely. 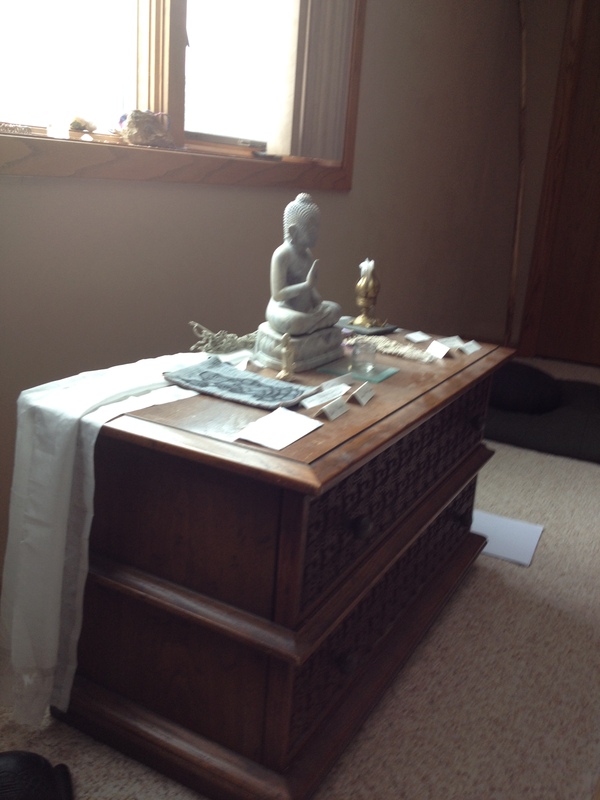 The farm has a zendo, an altar, and people’s names on that altar who have asked for support: sickness or other life difficulties. There are people who have died, and soon I will do a memorial service both for those people in my life, and for a long list of people murdered in Ferguson, the Middle East, and elsewhere over the past few years. The increasing violence and hate in the world is, along with climate change, an integral part of my practice and of the life here. At the conference there was a Jizo garden, a place of great warmth and comfort. Jizo is a Buddhist folk character who helps people, especially children. 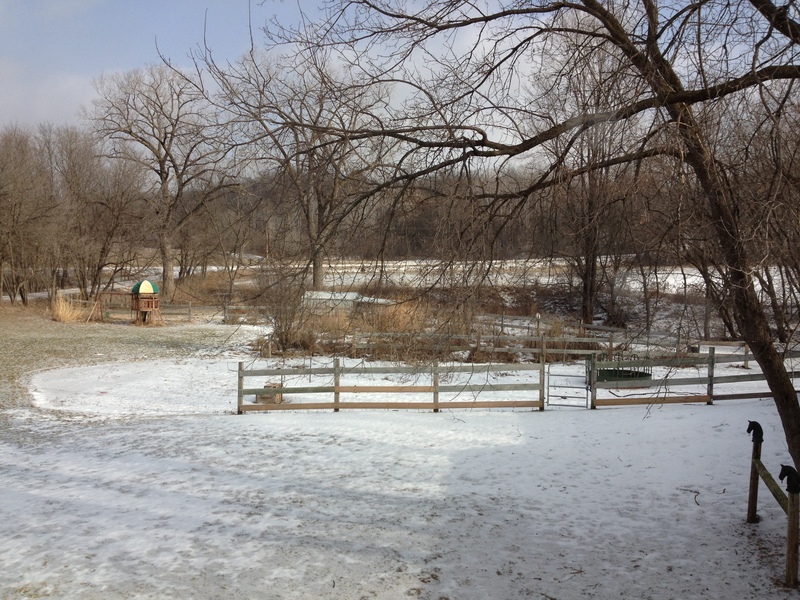 We will be making a Jizo garden here, with help from the wider Minnesota Zen community and of course open to all. Having lived in Zen community gives me a vision of how this community may operate well, and I’m holding that as more important than getting bodies in here to help with work and costs. I’ve paid some people a modest wage for hard physical work, but that can’t go on forever. New people are adding themselves to the websites. I don’t know where you are physically, but do know who some of you are. As we move into fall, I send warm wishes and blessings to you all. Hi all. I’ve spent the last 2 weeks learning like mad, mostly permaculture and farming topics, and have much to share but need to go outdoors and work. The goats are going back tomorrow; they were wonderful but it just took too much time to take care of them the way I wanted. (I loved taking them for walks; I didn’t love trying to get them back into the fence.) Hopefully in the future of more residents, there will be goats again, and chickens and other animals as well. 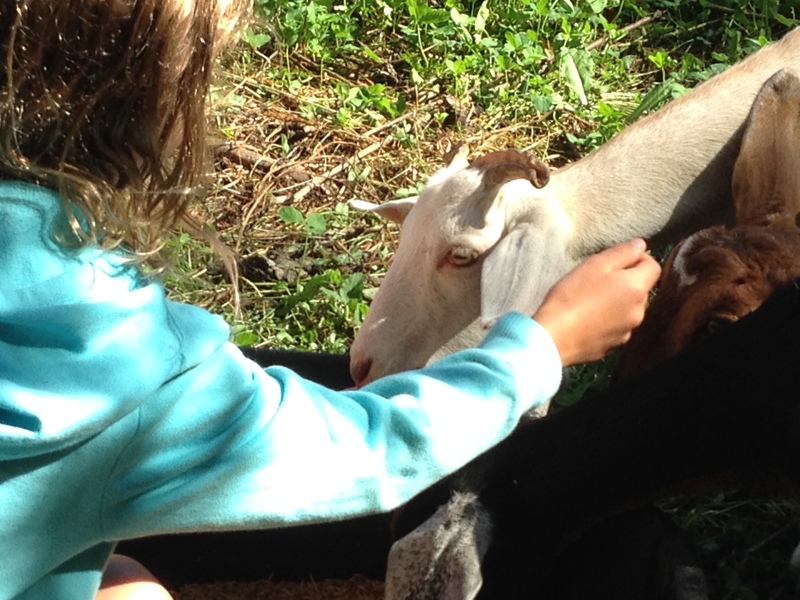 Here is a photo of “Brave” letting my granddaughter pet him. Here we have three events on the calendar, two land-related and one Zen teaching. Saturday, September 27, 1-4 pm (or 9-4). at Vairochana Farm, 16922 Cabot Ave, Fblt. Sheet mulch workshop – learn the natural method of gardening without tilling. Suggested donation $5; or come at 9, help move materials into place, and no donation. RSVP for carpooling. Morning people, bring your lunch. There will be information and handouts. Carpooling is more than recommended, it’s almost essential due to parking limits and climate change. RSVP is to help planning. I’ll send some reflections when I can. It’s starting to look like fall, and still unimaginably beautiful. How can a world be so precious? The bridge looks beautiful, but the area to the right of it is washing out more with every rain. I no longer use it to walk to the beautiful bluffs on the Cannon River, because it seems that fragile. Less than 4′ wide in sections, and washing out from underneath. On Monday and Tuesday, September 1-2, I invite people to come and help solve this problem. Depending on what tools we have, we may move rocks and/or build a wall; we definitely will work on water management, including moving trees into place for diversion, and creating overflow spaces upstream. Volunteers will receive work exchange credit for future farm events; otherwise $10/hour. Most of this is heavy work, but there are plenty of other options beginning with a cook. There is sleeping space indoors and outdoors. I absolutely need to know if and when you are coming, and whatever you would like to tell me about skills. The land bridge to the woods, threatened by erosion. The rains have come. What was dry has become green, and as an extra blessing the mosquitoes have not returned. For over a week, every day it would promise to storm and then quit, returning to sunny blue skies. So it’s no surprise that I left my laundry out and it got soaked. The goats have escaped twice; it was not a disaster, and yesterday I took them for a walk. They nibbled here and there, leaving my lawn looking much better. I did pruning; they disappeared a few minutes after I turned my back. Repeatedly. But it’s a joy to watch them going wherever they want, jumping and climbing and so forth. Because of them, I found the place in the creek that can easily be dammed for a pond – sand beach and all. As I put up the fence while they watched, I imagined they saying “Hands up Don’t shoot.” Not quite right, of course, I am merely imprisoning them. But Ferguson is on my mind. The amount of work to do is overwhelming. All the time: freeze another quart of beans, save seeds, make vinegars and pickles (exciting new learning), look for tomatoes and zucchini. Forget about housecleaning; I barely keep food and semi-clean clothing going. Before winter: get wood stove in house. Cold frames or something to protect my late vegetables. Cut firewood. Varnish the deck and seal a couple potential leaks. 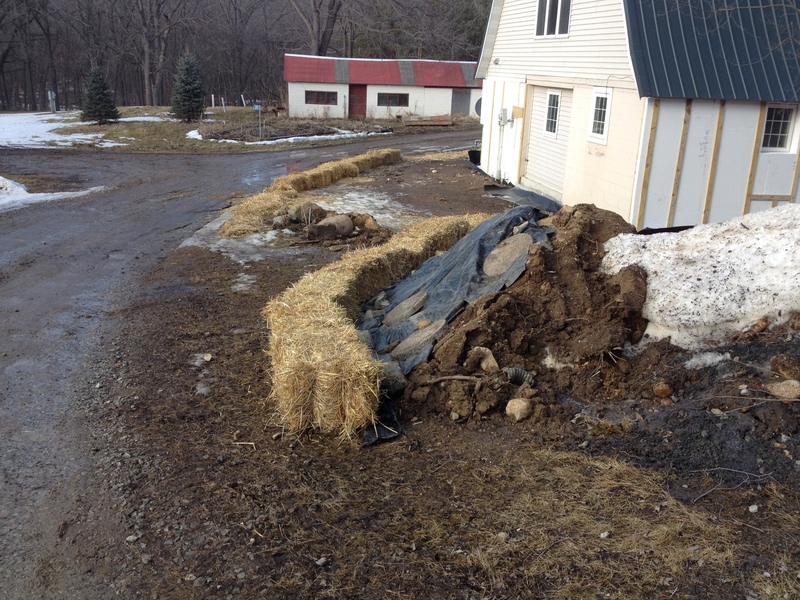 Before the next torrential rains: erosion prevention in two places (protecting the driveway and the land bridge to the north half of the land). Yesterday we started working on the driveway part: me, Joe (farm manager with many more skills), and two 13-year-old girls who were very impressive. The piles of rocks in the picture need to be enhanced with a LOT more work. And I wanted to remove buckthorn, use the money from the grant. The goats will eat it, but it’s not going that fast. I want bunny fences on the main garden, and sheet mulch, and there are still trees to plant that have been waiting since spring. (Most are alive and healthy.) I want more time walking in the woods – especially now that the mosquitoes have gone. If anyone would like to come here and do heavy physical labor for a week or two, I’m happy to house and pay you. Even medium-heavy labor would be helpful. There is a guest room. You might make it possible for me to actually go to Ferguson for a week in September, as I would like to do. September 20, one-day sesshin (Zen retreat). Actually this may be canceled if I actually go to Ferguson. September 26, sheet mulch workshop. We’ll sheet mulch much of the main garden, including making some keyhole beds. Orientation: How to do this in your home garden. Without buying materials. No charge, but there will be a parking fee if you drive alone in a car. To discourage fossil fuel use, and also we don’t have that much parking space here. Yesterday a friend and mentor came over, we talked, and we went for a walk in the dark. Only starlight, except a little glow from the two closest towns. She talked with me about listening to the land, about the feel of it (which she finds more like Anishinaabeg than like Dakota, and she has connections with both), about trusting, about how it would help me. Because I’m living in paradise. Yet occasionally, reading posts from Doug Grandt with Moccasins on the Ground or wherever he is, I remember living on the road and walking under the sky, day after day, and being part of that community. Here, mostly alone, I am in a way underground, growing into the earth here, being led by the frogs and snakes and sounds of eagles and water and wind. It is a miracle. A little lonely, but that’s how it is sometimes. I think this is my retreat time, though it looks like work and busyness, and when it’s finished then people will begin to come and live here. My friend told me to take four years to listen, to learn what the land has in mind. It’s hard to imagine that level of patience, when I’m thinking things could collapse at any moment and I want the food growing now. I need to be told again, again, and again. This is no mere paradisal dream. Its hardship is its possibility. You can find the whole poem online. It encourages me, even though he wrote it long before climate change was in our awareness and thus it may not be possible any more. Every action we take is a ceremony, an act that influences the future of ourselves and the world. There is no waste, no time off; our play matters as much as our so-called work and maybe more. Beth tells me, what I write is full of life. I am surrounded by life here, and doing my best to allow it to re-create me. Next week I go to the North American Permaculture Convergence; in October at the Soto Zen Buddhist Association conference I offer a session talking about the Compassionate Earth Walk as ceremony, and co-lead a session on Buddhist response to environmental crisis. And by November I hope to finish the editing of my teacher’s major commentary on Dogen’s Mountains and Waters fascicle – the core teaching about our relationship with all that lives. Please hold me in your hearts. Come when you can. Conversation happens at http://www.wheedu.com/groups/vairochana-farm#/ And there is a place there for “supporters,” which is actually a kind of classified ad which is still free, and which will eventually generate some income for the farm. 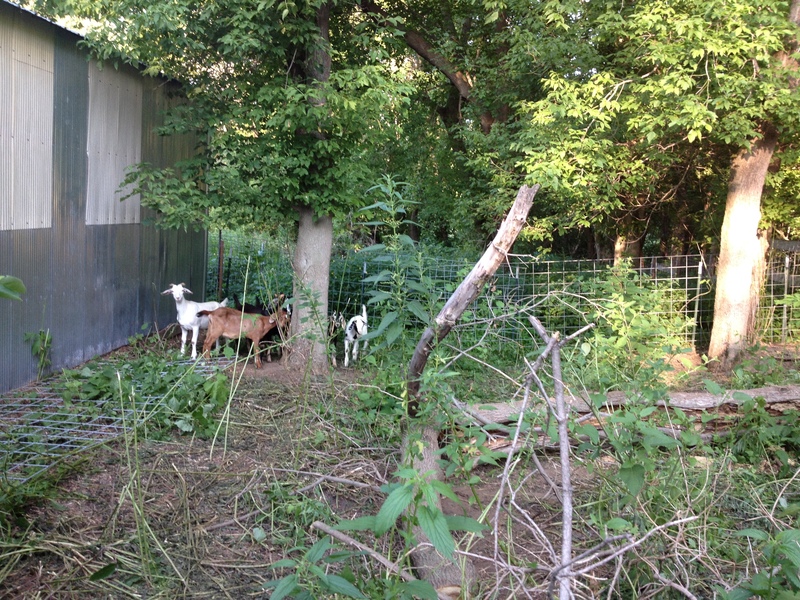 Seven goats arrived Thursday morning, to spend a few months eating brush and giving me a chance to figure out whether I want to live with goats. So far the only hard part is needing to move the fencing every few days. They still won’t let humans come near, even though I’m spending half an hour sitting quietly in their pasture every day. I think we’re doing a little better. Also: we’re in harvest season. I went away for 2 1/2 weeks and returned to find weeds overgrown like crazy and a lot of food: peas, beans, greens, the first zucchini – and a lot of promises. I found the raspberries! I get unreasonably excited about these small things. There are lots of things to do: get the house off propane heat before winter, the big one. Work on water management before the next flood season, probably fall, to avoid more erosion. And take care of the gardens, shrubs and trees already planted, plant more, harvest, mow the lawn…daily life. My two weeks away were at a training institute for Soto Zen priests, on the topic of caring for the Zen community. I’ve also had helpful conversations with friends and supporters. Several people have told me “Just do your practice.” Some things are becoming clearer. This is not the time to invite students to live here – not until the place has actually become a monastery, whatever that means. It’s also too early to be doing a lot of outreach. I need to settle in. There was a discussion on hermit practice by Red Pine, which helped me immensely. “… in China the hermit has always been seeking the wisdom with which to guide society…. Persons who could “break the mold” and become teachers almost always required a period of seclusion for maturation.” This is my time to clarify what my practice is, hanging out with the plants and the stars and the land and finding my own rhythm of practice, more than any words, and only as isolated as I care to be. Though I’m not offering much, zazen is different – just part of my practice. The first one-day sesshin here, last Saturday, felt like coming home. One person came for part of the day and requested instruction, and we sat together toward the end of the day. I’ve posted a sesshin schedule through December. If you would like to get email announcements of events here, sign up at http://www.wheedu.com/groups/vairochana-farm#/. If you’re signed up here, you’ll just get the occasional post – which are also at the wheedu site. All of this is in context with what’s happening in the world. Death and flames in Gaza. Drought and floods and climate change, many places, and both practical and legal dealings with all of it. “Life-and-death is the Great Matter; impermanence is swift. Do not let your mind slacken,” says Dogen, founder of Soto Zen, my home. We are called to attention. I came home after 2 weeks in a Zen priest training, and today is my first day. It’s hot, the garden, weeds, and grass are flourishing along with most of the baby trees, and tomorrow I get eleven baby goats to take care of for the summer. Meanwhile, needing one day off and time for reflection, instead I went out on the tractor to mow. And I enjoyed it. The world is out of control: Gaza is a nightmare, climate change is out of control, and the conversation on Facebook is full of extremes (to mention just three). My life is out of control: flood damage to prevent before the next rains, keeping relationships and handling the gardens, and the book to edit. And what if that mysterious thing in my lungs actually is cancerous? Once again I don’t have health insurance. I’m acting as though I have decades more to live and work. So, instead of sitting zazen or sitting with my journal, I went out and had the pleasure of watching the long grasses fall, making neat borders between tame and wild, enjoying the power of how fossil fuels are so much faster than one body with a scythe. (And wondered how fast I can convert lots of this lawn to better things. All steep lawn places WILL become gardens.) Watching the frogs jump, and noting gladly that they always move before the blades arrive. And then the mower quit mowing. Is it expressing me? I suspect it’s a certain bushing, and the question of whether I can get it up onto blocks and look underneath – safely – or haul it into town (which requires getting it up onto the truck) – I have postponed until tomorrow. We have planted a couple dozen fruit trees and bushes, most of which look alive and healthy. There are several small gardens and a lot of vegetables that look well; some are overgrown, some going to seed, and when the time comes I will have lots of squash, melons, cucumbers, and more. I remember little, but the plants seem forgiving. Some of the perennials (rhubarb, scorzonera) are thriving while others (asparagus) are faltering. It’s all learning for me; I’d just started gardening after my first permaculture course, then forgot most of what I’d learned. The rabbit fences are not up, and a search for “rabbits” and “green beans” tells me not that they probably ate my beans, but that I shouldn’t give my pet rabbits too many. I’ll take that as a yes. For most of spring I foraged; I love wood nettles and they are so healthful! There are still young ones out there to gather, and it’s on my “list” to fill the freezer. But yesterday I froze radish greens instead, and today probably lamb’s-quarter and Asian greens. Have to look up how to save seed from the Asian greens, and whether to plant some more. The poison ivy is doing really well, even where I tore it out. As is the wild cucumber. Wild grapes are an unexpected menace, but some seem to actually have grapes; excitement! There are tentative plans for public programs, still without dates: building a solar oven, building a solar food dehydrator – large!!! Buckthorn removal, for which some government agency will pay us – but are there really volunteers for that? Primary thoughts for income are selling off black walnut trees (there are so many they need thinning for the health of the forest), and maple syrup in the spring. Other possibilities include mushrooms, black walnuts. Long term plans include chestnuts and hazelnuts, other nuts and fruit, maybe sunflower oil, a plant nursery. All require investment, tools, and learning. I’m alone here, though many people have visited and the “we” means me and Joe, the part time farm manager. The work wants more people to live here. But I am encouraged by the words of Red Pine (Bill Porter): “My conversations with hermits in China led me to conclude that [for them] seclusion was like going to graduate school. Afterwards they can teach….Persons who could “break the mold” and become teachers almost always required a period of seclusion for maturation.” So there is no hurry. Eventually, I hope there will be six long-term residents (the legal limit), peers, along with teaching that includes residential group practice. We had a dedication ceremony in June, about 20 of us, in addition to some private blessings with individuals from different traditions. December 1-8, Rohatsu sesshin commemorating Buddha’s enlightenment. Also the Northfield sitting group (formerly a class) will resume in September, alternate Wednesday evenings. I strongly hope to offer the Dharma freely, as I received it, and support teaching and practice through farm activities. And I hope that there will be donors. When it’s time to build, there will be a fundraising campaign. I’ll try to write more often. In the middle of moving to the farm, I notice that I haven’t been updating. I’ll add a photo or two and brief information. 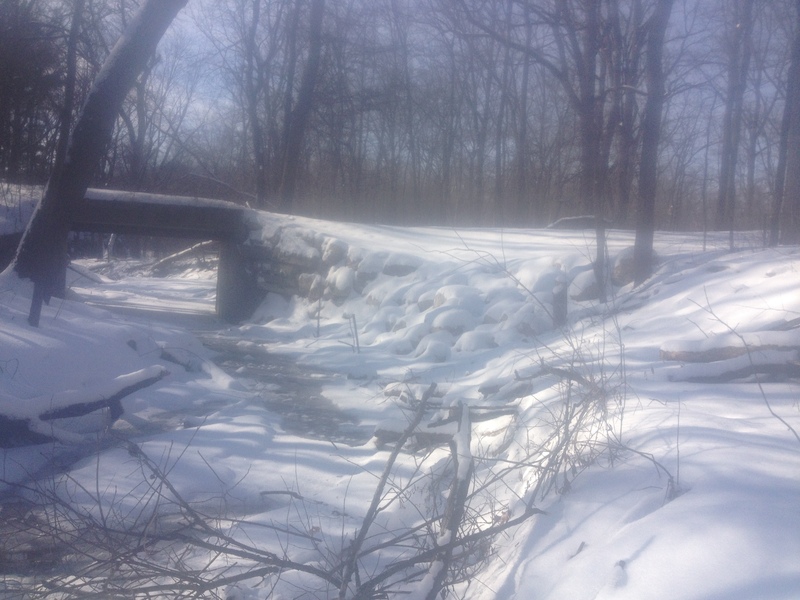 The farm is 17 acres near Faribault, MN, in the Cannon River Wild and Scenic District. The house is a converted barn, and one of the projects will be adding bedrooms. The land for Vairochana Farm has just been purchased. During summer and fall of 2014, you are invited to live, work and practice here. Practice style will be Antaiji/Uchiyama Roshi style. Details: morning zazen plus additional retreats and study opportunities; approximately 30 hours of work per week; initial stay 1 week, with mutual agreement for longer stays; no charge, but refundable deposit is due on acceptance. We hope to be accessible to people with disabilities including chemical sensitivity. Vairochana Farm is located near Faribault, Minnesota, on 17 acres with a converted barn and several outbuildings. 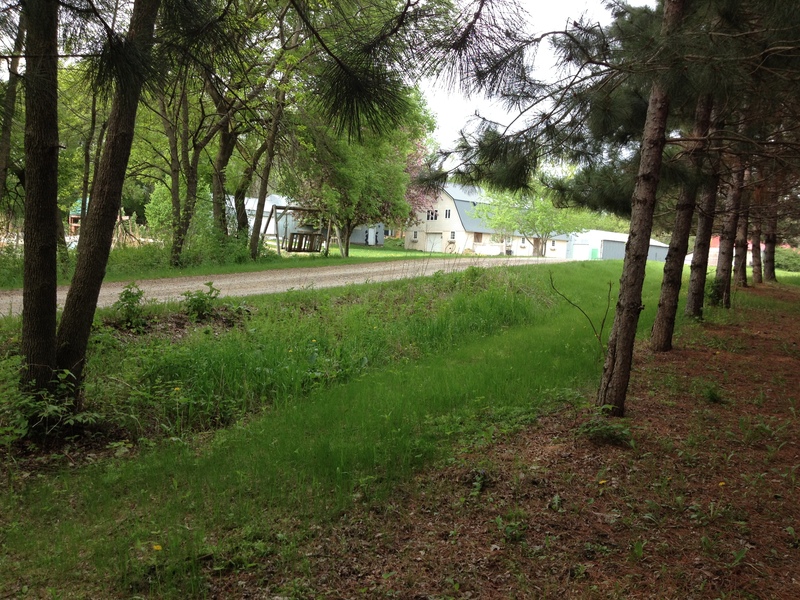 The land is woods, hills, pasture, and creeks, walking distance to the Cannon River and about an hour from Minneapolis. The mission statement is in the May 19 post. I have made an offer on a 17-acre farm and if all goes well we will close in late April. I’ll be looking for summer guests/interns/workers to help plant trees, fix up outbuildings, and whatever is needed. It is in the Cannon River Wild and Scenic district. More details will be added after closing, but if you’re interested in coming for part of the summer please write a note now and we can stay in touch. 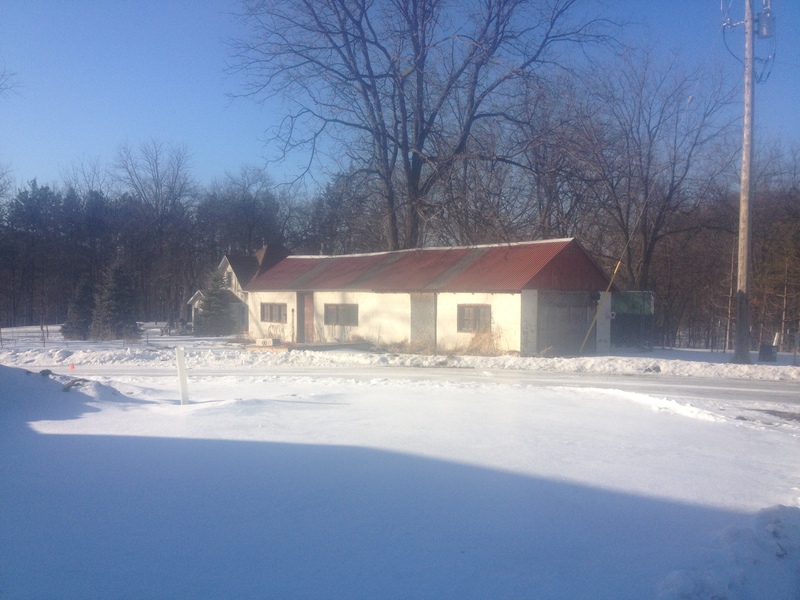 I’m looking for people of good will and strong energy to help me build Vairochana Farm, a small permaculture farm with flavors of Zen, activism, and a strong sense of community, near Northfield, MN. You can come for a while, live and work here, or we can be finding out whether you will join the long-term community. I’ve backed out of the original plan and am looking for beautiful land on a river. This might involve building from scratch. Farm skill, garden skills, permaculture design, and construction skills are particularly welcome. But there’s plenty of simple labor too. The intention is to live and farm in a way that supports the earth’s regeneration, grows food, and moves against climate change. The house will be made energy-independent; we will store rainwater for drinking and design a water-saving landscape. Our community will eventually include gardens, orchard, forest, wild plants, and animals. This will be a residential community, with both long-term and short-term members, sharing social, spiritual and work life with friends from the broader community. We will find our own way of being together, using wisdom from many past groups. Children will be welcome. We intend a strong and friendly presence in our local area, including hosting events from barn dances to community meetings, and participating as responsible citizens in building a strong and sustainable region. I hope we will develop a shared spiritual life on some level. As a Zen priest, I practice daily sitting meditation and will be offering occasional retreats, workshops, and classes. Living here does not obligate you to participate, but you need to feel comfortable around it, particularly if you become a long-term resident. People who think spirituality is silly probably would not be happy here. Human existence, and the continued existence of the planet as we know it, are endangered. It may already be too late. Thus the issue of life and death informs every action in a way never known in human history. Finding an appropriate response to this situation is part of the intention here. Exactly what that means will be discovered as we go forward. We’ll be on land that should belong to the Dakota people. I’m looking into ways to address that – which at this point just means making some contacts. The house will be smoke-free and scent-free, because of my allergies. It might be workable for a person with chemical sensitivities – check it out. Food – ? No longer vegetarian, I eat mostly organic, whole, fresh foods. I love cooking and eating together. Alcohol in moderation please, and no illegal drugs. I am a single woman, 64, with children and grandchildren in the Twin Cities and elsewhere. I expect them to visit, and would expect you might also have visitors. Other things about me – I am a psychotherapist (retired) and an alternative healer (still play with it), spent the last 12 years of my life in Zen training and received dharma transmission from Shohaku Okumura. I have been gardening since the permaculture design course in 2006, and am in recovery from Western civilization. Rehabilitate the barn, animals below, possibly workshop space above, gathering water from the roof. Chickens, goats, sheep, possibly cows that provide eggs and milk (and cheese etc) and mow the lawn, dig or weed the gardens, etc. As soon as we have a stable enough community to care for them. Edible forest: expand and support the existing orchard, plant forest guilds near the road, learn to harvest the gifts of existing trees (oak, maple). Build or modify the house, with insulation, enough bedrooms, large solar greenhouse, water collection, solar panels, partial green roof, and water collection. House is to be energy-producing. Build at least 5-10,000 gallons of potable water collection we will not rely on well water. Sauna or steam room for luxurious bathing. Pond, hopefully swimmable but unlikely, or river or creek. Zendo and other public spaces. Any existing outbuildings are salvaged, insulated and made functional.